I'm waiting for it. Maybe you are too. It's not pretty. And it's not something that I like to admit. But it's something that I know is true of myself. So since the sun is shining bright on the city streets below our third floor condo, I might as well let the sun shine bright on those parts of my heart that I like to hide. Dr. Phil. Rachel Ray. Suze Orman. Nate Berkus. That person who wrote "The Secret." What do they have in common? Oprah Winfrey. Oprah met these individuals. Recognized something special about them. And gave them a platform. She introduced them to the world. She helped mold them. And she launched them into their own unique careers. No, this isn't a post about Oprah, but what I call the "Oprah Moment." I don't know if you want one. But I do, and that's the part of me that I want to hide and minimize. The premise of this theory of mine is that deep down we want that moment where someone looks at us and says, "You. You there. You are good. You are talented. Your voice is needed. Write!" And with that they not only give us their blessing, but then share our words, the words that we have been crying over, praying over, and sweating over. They share them with the world, add us to their Google reader, and just like that we have it - validation. Validation for the stolen moments writing. For the thoughts that drifted as we were rewriting a transition in our head. For notes scribbled on every piece of paper in the house. For asking for a sitter so we can get away and have two hours of quiet. For time spent on Twitter and Facebook. For reading blogs. For reading books. For all of it. And yes, it is ridiculous. I am so aware of it. But deep down...deep down it's there. It's longing. It's feeling unworthy. And it's comparison. 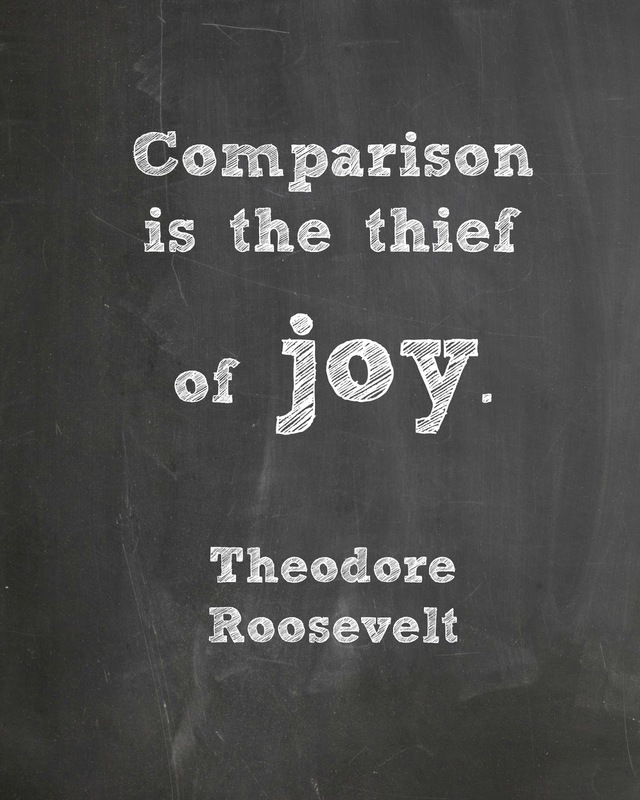 Comparison is ugly. And it's dark. It's the cloud covering up a shining sun. It obscures. It steals. This heart of mine? It's pretty tender. And it feels things deeply. And it can be hurt easily. I have allowed comparison to hurt me. To wound me. My joy hides. It hides behind stats. It hides behind page views. It hides behind followers. It hides behinds likes and shares. It's stupid and it has to stop. I am part of an amazing group of women going through a writing adventure together. And each week, each day, we become more brave. We try new things. And no one is comparing themselves. We affirm. We push. We don't steal joy. Each day we tell each other, "You. You there. You are good. You are talented. Your voice is needed. Write!" Here the encouragement of fellow storytellers and creatives helps push away the comparison that is clouding our joy. Odds are, I may never get my own Oprah moment, and that's okay. I'm grateful to be surrounded by folks who do encourage me here at my tiny corner of the blogosphere. And at the end of the day, when the girls are sleeping and the lights have turned off, and the only sound is the hum of cars below and the tinkling of the wind chimes, I'll remember that my words are given to me by my Creator. I'll close off to the noise that tends to fill my ears and I'll hear His words as I drift off to sleep. "You. You there. You are good. you are talented. Your voice is needed. Write!" That. That will be my joy. Your words are beautiful, and I can so relate to secretly wanting a kind of Oprah moment and that steals joy. Thanks for your refreshing honesty! Love that quote and you were so brave to say it honestly here. I was actually thinking about this very thing, repenting of my needing affirmation from anything other than Jesus. I can say He is all I need but then I don't live that way when I compare myself or allow statistics to affirm who I am. But really, I think we were all created with that longing to belong aren't we? I often envision you living in the center of the city hub-bub when I come here. Love thinking about you three floors up looking down on those busy streets below. Can you tell I need an urban fix? Thank you for your transparency, for speaking truth that many of us, even from ourselves! Yes sweet friend, your joy is there! Your voice does matter and I see you. I am not Oprah, but I am a woman who shares the same Spirit within me as you do within you and I see you just as you see me. We are seen, heard, known and loved and we matter. We, this, is enough. Thanks for reading. Good to know we are all plodding through this together. Bless you. And you too! My heart bursts seeing you write! I totally could have written this. Except, not as beautifully. Thanks for giving voice to things I think about all the time. You know what really helps me? I write for my kids. I really do, but I write for me, too, b/c everything buzzes by so fast, and they're changing so quickly, and there are already things I've blogged that would be completely GONE if I hadn't. I know b/c I'll go back and read them and be, like, oh YEAH! Anyway, my point is, write down things for the people you love and have peace in your heart that--even if that's as far as ever it goes--that's far enough. and here is this beautiful soul spilled out in your words. this makes me love you all the more. because sharing our pain, our struggle, it does that, y'know? honesty and courage. know and be known. i love your heart girl. love the way you love. in the final analysis, that is what counts most, eh? oh man, do I ever know that heart as it most likely lies within a huge majority of us. Can I tell you something? It's not completely private as I'm posting it in a public space; but, here it goes. So I read one of your posts from January about when you were getting various affirmation or notoriety. One of which is having a piece of yours selected for the Soul Bare project. I want to say how happy I am for you. I also want you to know when I saw that, it was a silent moment, because my piece I submitted wasn't selected. I don't say that to make you feel bad. Rather, I have been realizing how I want that "oprah moment" a lot of the time. I think, "When that person acknowledges my work, or that person puts me in their link up, or, or, or..." But, I can't help but think how Jesus gives me just enough. Not too much, but just what I need. Oh and how I really want more, more comments on my posts, new adventures and affirmations of my work. Then, my friend gets opportunity after opportunity landing in her lap with me getting jealous. What Jesus reminds me of is how her baby would have been born just weeks after Caprice who died months before. How this friend would give all those opportunities away if it meant keeping her baby. my heart is stabbed with the reality of God's blessings. I admire your honest heart Brenna and I would be too lucky to meet you. That's the way!! Proud of you. oh. oh. do you know how I need this? How so many of us need this? Sharing this all over, friend. This is huge. This is truth. Thank you. Your thoughts/feelings are known to most all of us, I'm sure. I try to remember that a little handwritten note I received in the mail as a young teen, changed my life and destiny forever. Now my children are serving God all over the world. A handful of sentences in God's hands, seen only by my eyes, has changed my life, my children's lives, my grandchildren's lives and the lives touched by us as we and our children are all in ministry. So, any souls we touch, go back to the credit of the one who wrote that little note. "You. You there. You are good. You are talented. Your voice is needed. Write!" LOVE IT! thank you! A p.s. to my earlier comment-I am shamefully late in stopping by to say thank you so much for your kind encouragement on my Valentine post. I'm hopping over from the Imperfect Prose link up. Nice to meet you. Thank you. Coming from you? Huge! Good perspective. thanks for sharing! Absolutely. Thanks for the encouragement! Oh, Kamille. You know that you are one of the bloggers, with your beautiful words, that pushed me into finally blogging in the first place? What I have learned writing this is that so many of us feel this way. And it doesn't matter how "good" or "popular" we are....there is always a longing to achieve more. And honestly, I don't think that is a bad thing. I think part of it is just how we are wired...to do our best....to try to reach others....to feel connection. So much of this is about feeling connection. The followers, the stats, the comments, the shares....they are tangible ways we can see that our words, our broken hearts spilled out for all to see, made a difference. Let me go on record here, to say that your words, they way you live your life, the openness and the heart in it all, it inspires me, even when I am too busy to take the time (as I should) to leave a comment. You are touching lives and your words are beautiful. Thank you, Holly. My life is definitely full of those who love me and for that I could not be any more grateful. Thank you for always using your words to encourage and challenge! Oh, thank you so much. You have no idea how YOUR comment has touched me. Em, I am praying for you are your family as the new book is coming out. Praying peace and joy for you today and always. I feel this too, all of that Oprah-ness wanting. the validation, etc. And the comparison mind games can often be killer. I will very strongly consider the Thu. thing. I feel tremendously overwhelmed with writing right now...extremely raw & vulnerable...almost to the point I feel silenced...which is sad. maybe I need to do something like this to kickstart myself back on track....it's been rough. Brenna, I am working my way through an AMAZING book called The Artist's Way. It is a 12 week/12 chapter book helping us to un-block and tap into the flow. It's been so helpful for me, and I bet you'd love it, too. Your writing is great, by the way. You write about your existence as a human, we all relate to your story! Megan, that has been suggested to me. I am going to have to put it on my list very very soon! Thanks for sharing your writing as well! Nancy, if you are ever interested, let me know. Here is the website http://www.thestoryunfolding.com/ They do different classes. Mine is a 10 week class and you are with a group of women who really push you and challenge you and encourage you. There are two things that have helped me with my writing - the Imperfect Prose community and this. You should check it out! Grace, sorry I am not getting back to you sooner. You had a rough couple weeks. I am so proud of your ability to say what you are thinking, share what's on your heart and invite the conversations that most of us would shy away from. Definitely link up on Thursdays with us. You'll be encouraged and welcomed!!! Brenna, this is so wise. I read it when you posted it, but came back today from the storysessions thread, and it is just incredibly relevant to that journey, from competition into community. Let's take down that fallacy of the zero sum game! You lead the charge. I'm with you.